Two congressional committees have launched probes into the travel of the Environmental Protection Agency chief, who has faced backlash for his use of first-class travel on the government’s dime. Rep. Trey Gowdy, R-S.C., who chairs the House Oversight and Government Reform Committee, and Democrats on the the House Energy and Commerce Committee, sent letters to EPA Administrator Scott Pruitt on Tuesday asking for detailed information on his travel schedule and justification for booking premium flights. Pruitt and EPA have defended the first-class flights as necessary for security. The agency initially stated Pruitt maintained a blanket waiver to fly first class, a violation of federal regulations, but has since walked that back and said the administrator received a sign off for each individual trip. Gowdy asked Pruitt for documentation related to his travel to help the committee determine whether "federal regulations regarding official travel were followed." Specifically, Gowdy requested information on every flight Pruitt has taken, including the departure and arrival airport, business reason for the trip and class of flight; documentation of any waivers to fly business or first class; and other EPA employees or security officials who flew first or business class on those flights and the costs of those tickets. Democrats on the Energy and Commerce Committee asked for similar documents, as well as information on the analysis EPA has conducted to indicate “enhanced security is achieved by premium travel.” They also asked whether other political appointees have blanket waivers to travel in first or business class and whether the White House has authorized any such travel. 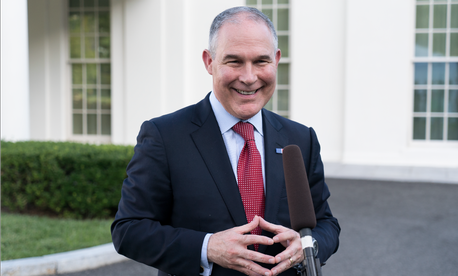 The lawmakers noted Pruitt’s first class flights continued as its budget requested a funding reduction of 23 percent. Congress has consistently slashed EPA’s budget since 2010 and since that year has shed more than 2,500, or 14 percent, of its workforce. During one stretch in early June 2017 alone, according to documents obtained by The Washington Post, Pruitt spent $90,000 on military and first-class flights. At a White House briefing on Monday, Press Secretary Sarah Sanders said she had “no reason to believe otherwise” when asked if President Trump still has confidence in Pruitt.